Immediate postoperative ambulation minimizes thomboembolic complications following a laparoscopic gastric bypass. A prospective analysis of 461 patients. Introduction: Bariatric surgery remains the only therapy that produces significant and sustained weight loss in morbidly obese patients. Bariatric patients have been traditionally viewed as a high risk population for thomboembolic complications, which are major cause of postoperative morbidity and mortality. Materials and Methods: Four hundred sixty-one consecutive patients who underwent laparoscopic Roux-en-Y gastric bypass (LRGB) at our institution between August 2001 and April 2007 were prospectively analyzed. All patients met the NIH criteria for bariatric surgery and were operated on by a single surgeon. Our DVT prophylaxis protocols included perioperative sequential compression stocking for all patients and selective intraoperative and postoperative use of subcutaneous Lovenox or Heparin. All patients were subjected to an immediate postoperative ambulation regimen that was part of our center’s clinical pathways. Selective postoperative lower extremity duplex studies were performed on patients complaining of extremity pain or swelling and on those having unexplained tachycardia or shortness of breath. Patients with hypoxemia, tachycardia, shortness of breath or tachypnea underwent chest CT with intravenous contrast. Results: Three patients with hypercoagulable states underwent preoperative insertion of vena cava filters. There were no incidences of perioperative DVT or PE in any of the patients in this group and no readmissions or late thromboembolic complications. There was a 94% compliance rate with aggressive postoperative ambulation protocols. Noncompliance of the remaining six percent of patients was due to patient’s inability to ambulate, postoperative complications or nursing staff noncompliance. 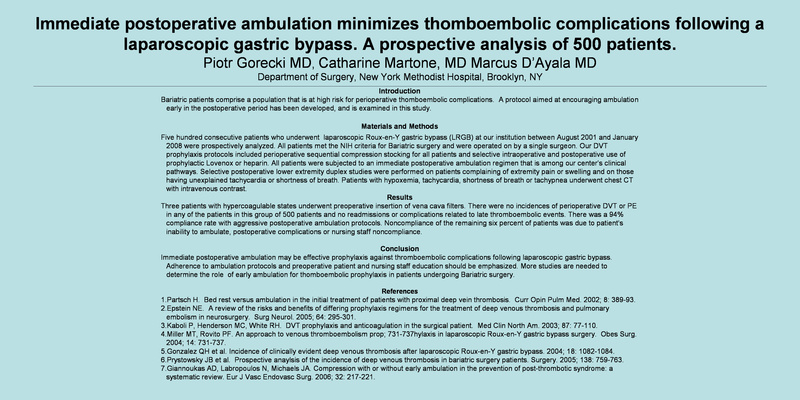 Conclusion: Immediate postoperative ambulation may be the most significant prophylaxis against thromboembolic complications following laparoscopic gastric bypass. Adherence to ambulation protocols and preoperative patient and nursing staff education should be emphasized.